I wanted to build a measuring instrument which must be placed outside, exposed to the natural elements. Some of my goals in doing this was to see how it would resist our very cold canadian winter (sometimes -40 Celcius/Fahrenheit, not including with wind, and yes, it did resist) and to learn from my mistakes if something goes wrong. 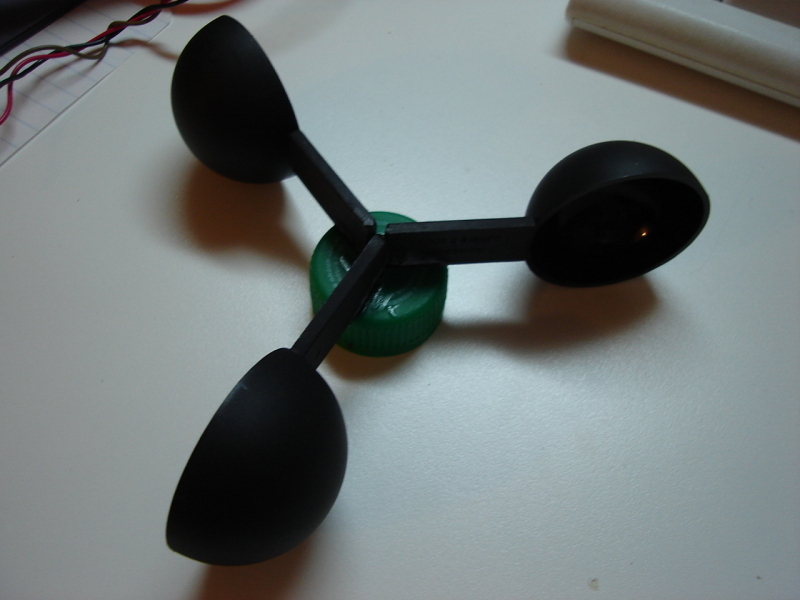 I chose to build a cup anemometer ( link to wikipedia's anemometer entry ). This instrument has some electronics to keep track of the rotation speed and these components must be protected from water (Otherwise, oxydation would cause problems). Also, the mecanical parts must be able to resist strong winds, and cold temperatures. 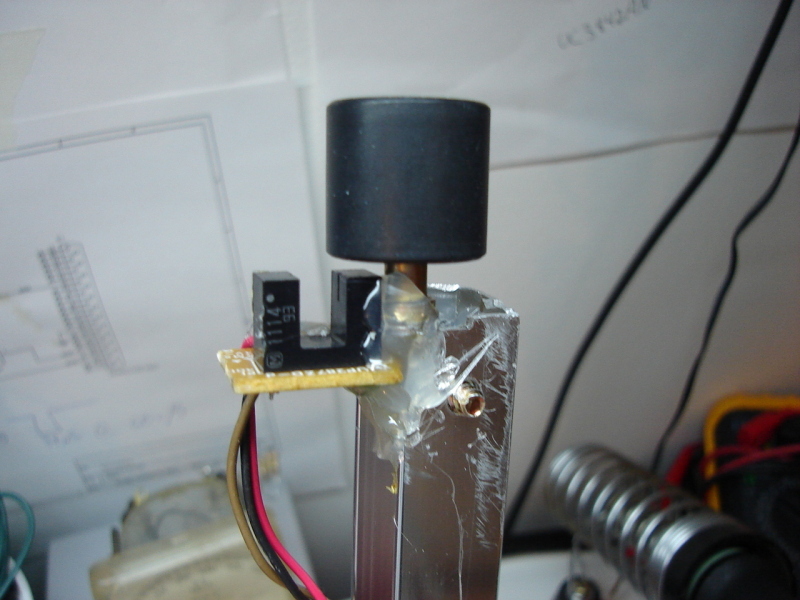 Moreover, the rotating part must offer the least resistance possible in order to be able to measure light winds. 5 minutes average, image updated hourly. Click image for weekly, monthly and weekly graphs. Anemometer is located in St-Hubert, Quebec, Canada. Here are the 3 cups the wind will set in motion. I used plastic coffee spoons from the "one dollar" store. They cost me 1$ (CAN) each. It's the only thing I bought for this project. The black thing on the picture is the component which allows an easy rotation. It's a pinch roller salvaged from an old vhs VCR. It rolls really smoothly. When I spin it with my fingers, it runs for 30 seconds or so. The 'U' shaped piece is the slotted infra-red sensor. One side of it is the infra-red emitter, the other side is a detector. After taking this picture, I glued a small tie-wrap plastic piece to the pinch roller so it blocks the infra-red beam once per turn. Everything is mounted on the aluminium stick. The coke cap which holds the cups is glued on a spray paint cap. 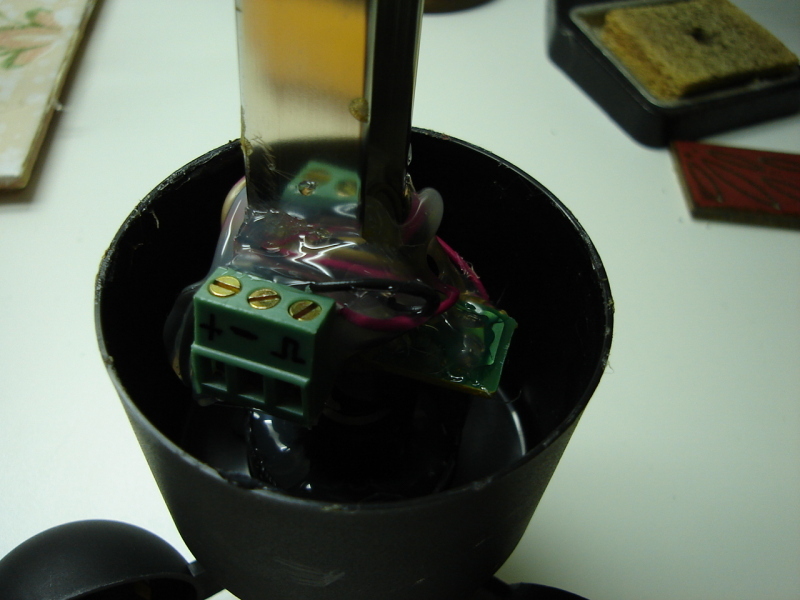 The cap is glued to the pinch roller. The spray paint cap purpose is to protect what's under it from snow and rain. There is still a small chance of water infiltration in the case of ascending winds, but I decided to ignore this and hope for the best (tm). 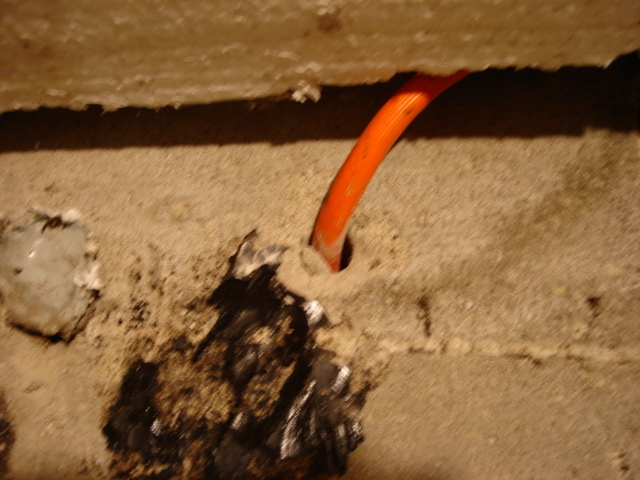 I used a triple contact terminal block as conector. The two first contacts are for 12 volts DC power and the third one is the output. The signal stays at 12 volts except when the infra-red beam is cut. 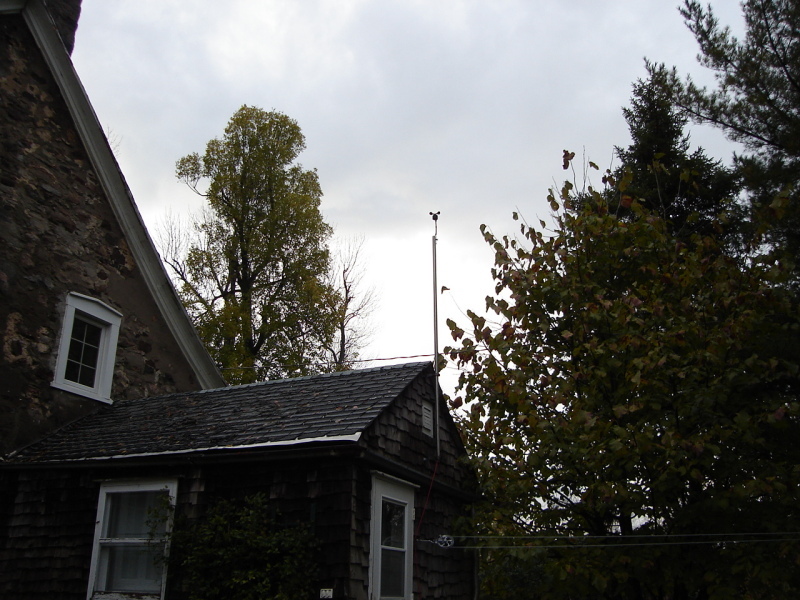 I installed the anemometer at the top of a pole that was previously used for an antenna. It's a little too close to the house and trees which are most likely modifying the wind trajectory and speed. Even if the location is not optimal, it works. 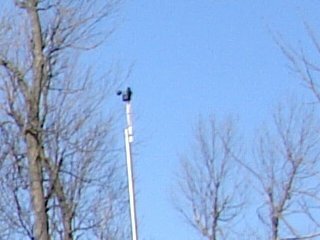 Spring 2006: The anemometer has survived winter! And it still works perfectly. 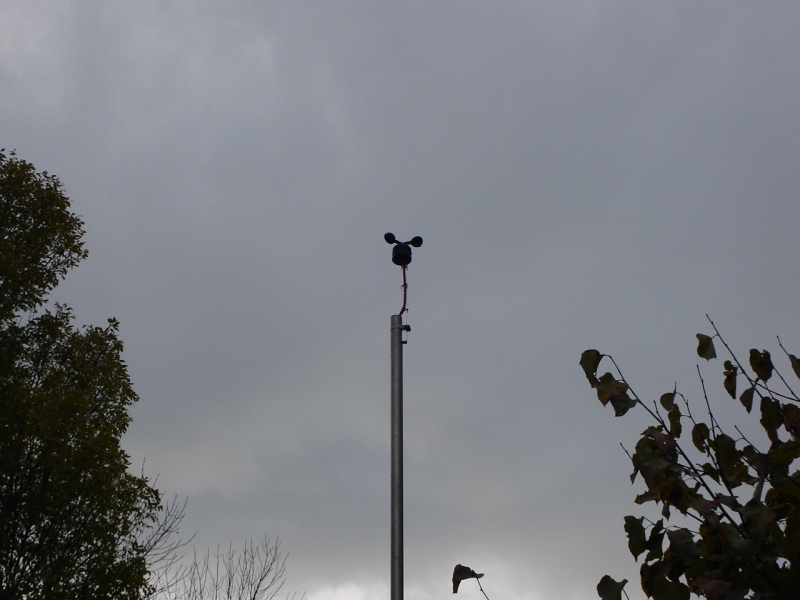 Building and installing the anemometer is not all. We must be able to measure the speed and send it to a computer if we want to do more than look at a blinking led. 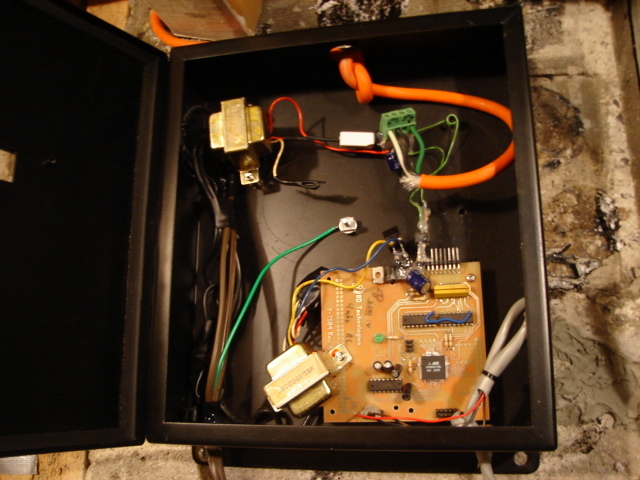 To build the controller, I recycled an old prototype board I had made at work in 2003. There are 2 transformers because I wanted the outdoor equipment to be electrically isolated from the equipment indoor. The upper left transformer powers the outdoor stuff. 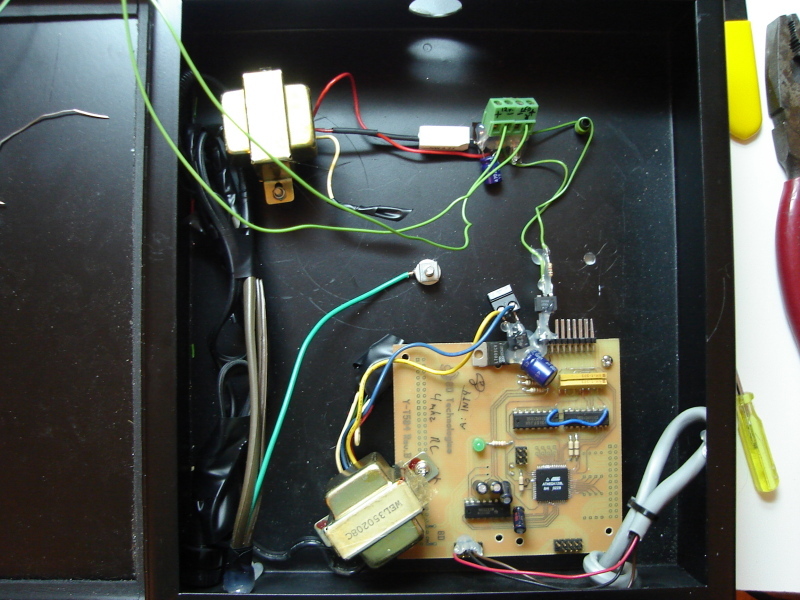 There is a big resistor that is there to heat in case there is a short circuit outside. There is also a diode bridge and a capacitor to make DC from AC. 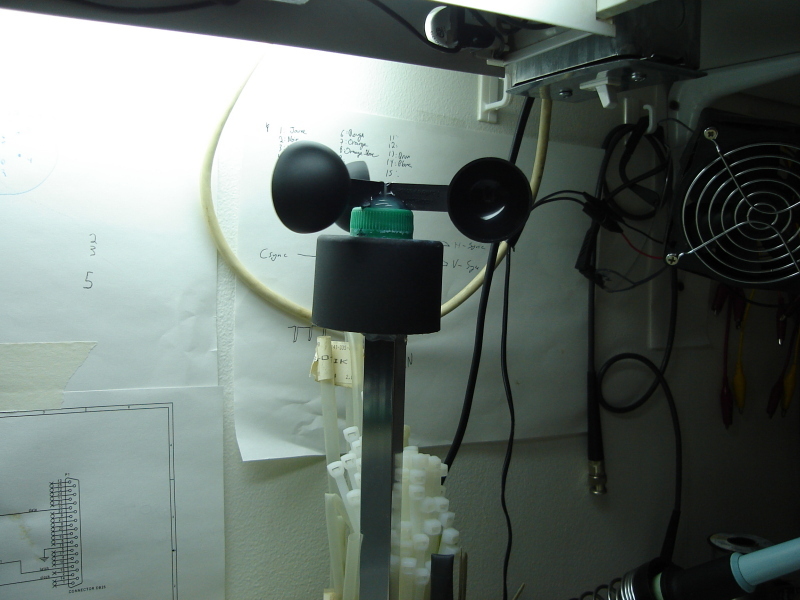 The signal from the anemometer makes an opto-coupler's internal led blink. The microcontroller monitors the signal coming from the opto-isolator to measure the rotation speed. 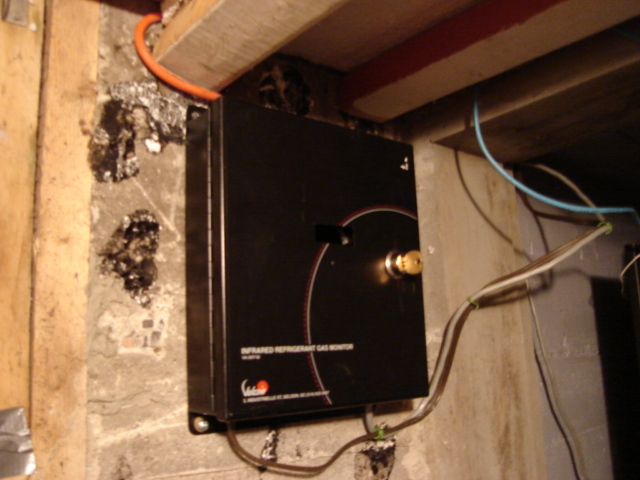 It communicates with a computer over an rs232 link. On the computer, at each second, a program records the last 5 minutes average and the last 5 minutes top speed. 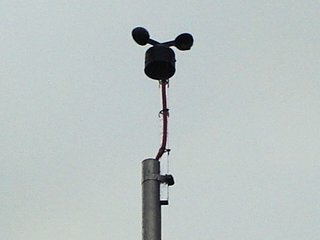 I have not taken the time to calibrate my anemometer before installing it, so I cannot map it's rotation speed to wind speed. However, I'm able to see how the wind fluctuates. Meanwhile, I can't wait to see how my homebuilt anemometer will fare this winter.